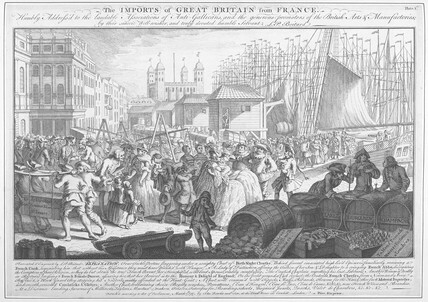 The Imports of Great Britain from France. Title continues: 'Humbly addres'd to the laudable Associations of anti-Gallians and the generous promoters of the British Arts of Manufactories by their sincere well-wisher and truly devoted humble servant. L.P. Boitard'. Line engraving. This print depicts a busy dock scene with the Tower of London in the background. The artist is satirising the English enthusiasm for imported French fashions and luxury goods. France led European fashion during the 18th century. French society was characterised by the Paris salons where groups of cultured men and women discussed the latest developments. Near the centre of the picture is an Indian servant wearing a turban. London merchants brought back servants from Asia and Africa whom they treated like pieces of exotic property.